The 2016 edition of the Francis A. Drexel Library’s Season’s Readings is now available. This year’s list is full of interesting books as exciting as previous years, with something for everyone. Peruse the list and get that special someone a great holiday gift, find something for yourself, or simply give the list itself as a gift. 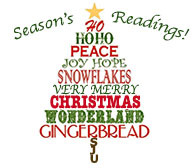 Click here for Season’s Readings 2016! Previous PostFinals Week in the PLC and Drexel LibraryNext PostCampus Coffee Hour with the Boland Hall Art Gallery!